No fewer than 20 members of the Shi’ite sect were killed, yesterday, as the military cracked down on the sect for blocking the highways during their public procession in Zaria, Kaduna State. The sect, however, claimed that hundreds of its members were killed by soldiers who stormed three of its locations with heavy military weapons. It was gathered that the troops engaged members of the sect throughout the night as heavy shootings and sounds of explosions were heard in Gyallesu and Sokoto Road, where Hussainiyya – the spiritual centre of the sect – is located. While the Army accused the Shiite followers of attempting to assassinate Nigeria’s Chief of Army Staff, Tukur Buratai, the Islamic movement said soldiers simply decided to attack “defenceless people”. The army on its part vowed to put an end to the threats, delays and disruption caused by the group. In its account of the violent confrontation between it and the military, the sect, in a statement by its spokesman, Ibrahim Musa said: “Following alleged blockade of the route of the Chief of Army Staff by the members of the Movement, the Nigerian Army brutally descended on armless members of the Movement with heavy military weapons killing indiscriminately. “In the mean time, leading members of the Islamic Movement and other members as well, have been killed by the soldiers including the leader of the Kano Center, Sheikh Muhammad Turi, Dr. Mustapha Sa’eed, Malam Ibrahim Usman and Sister Jummai Gilima. “Also killed were Sayyid Aliy, the son of the leader of the Movement, Sayyid Ibraheem Zakzaky; the wife of Sayyid Ibraheem Zakzaky, Malama Zeenat Ibraheem and tens of other members as more are being killed as at the time of this release. “The sporadic killings took place at three locations that included the residence of the revered leader of the Movement at Gyallesu, the Husainiyya Bakiyatullah at the GRA and the Darur Rahma located along Zaria-Jos road where many unarmed people were killed. “The killing was so brutal at Gyallesu that even those injured in the shooting were identified and killed in cold blood by the soldiers. And as at the time of writing this press release, the victims are in their hundreds, if not thousands. 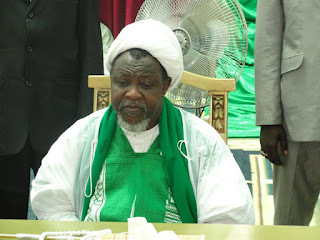 “Considering the gross violation of fundamental human rights and extra-judicial killings perpetrated by the Nigerian Army, the Islamic Movement hereby condemns these unjustifiable acts. “We state categorically that the claim by the Army that members of the Movement attempted to assassinate the Chief of Army Staff was a blatant lie as the army came back to launch their attack more than an hour after the COAS had passed. “Clearly, the Nigerian government through its military is now on rampage in an all out war with the Islamic movement, its members and structures. The scale of this attack would suggest it was meticulously planned by authorities and now being executed ruthlessly. The alleged attack on COAS Burutai was just an alibi. “Therefore, with all pointers at the government as the contractor of the killings, we hereby call on well meaning Nigerians and the international community to intervene and seek redress for the victims and their family members as many innocent people have unjustifiably been killed and many others severely injured. “In the mean time, there is no idea as to the where about of the leader of the Movement, Sayyid Ibraheem Zakzaky nor his current condition, and aggrieved members of the Movement across the country have taken to the streets in protests”. The killing of Turi, the leader of the Kano Center, has sparked tension in Kano, as members of the sect staged a rally from Saturday night till about 4am on Sunday. Another rally held on Sunday around Fagged Mosque, popularly known as ‘Waje Mosque’. According to a Kano resident, tens of thousands of Shi’ia members trooped to the nooks and crannies of Kano, passing through the palace of the Emir of Kano, Alhaji Muhammadu Sanusi II, and raining expletives on the military personnel attached to Tukur Buratai, Chief of Army Staff.